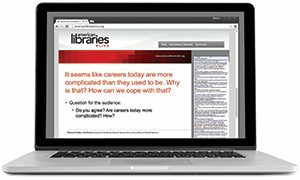 Library needs change as service populations shift, technology marches on, and ideas for new services blossom. These changes can happen over years, but they can also happen day-to-day as patrons seek a venue to serve their needs of the moment. The following buildings have built-in flexibility to adapt to what their patrons require. Service Flexibility: The renovation of the Porter Henderson Library created a number of niches throughout the building, each housing one to six students, as well as areas with movable furniture that allow users to create meeting spaces and reconfigure library zones. Classroom space provides computer connectivity for 32 students, but can also be modified for speakers, lectures, or small study groups. 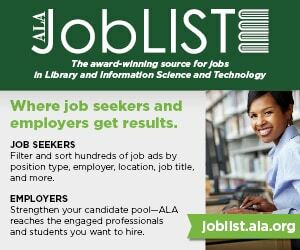 Service Flexibility: The Alphabet Landscape at Magna Library features more than 100 interactive elements linked to the letters. While many are obvious to even the youngest children, others are more subtle, offering new things for families to discover on subsequent visits. Service Flexibility: The renovation of Bobst Library’s fourth and fifth floors into a Graduate Research Commons is centered around a large reading room with fixed and movable tables in a number of shapes to encourage collaborative study. Zones become less interactive away from the reading room, with rooms for small groups and individuals, as well as consultation rooms where faculty can advise students in teams or singly. Service Flexibility: The Miller Branch features a dividable meeting room that seats 300 people, a historical center, and a community-based teaching garden opening in May that will focus on health, nutrition, and environmental education. Light settings can be adjusted depending on outdoor light levels to save energy, while an 8,800-square-foot vegetated roof adjacent to the terrace overlook includes Sedum and Phedmus plantings in colors that reflect the interior color palette. Service Flexibility: The Villard Square library occupies a mixed-use building that also contains 43 subsidized apartments that target grandparents raising their grandchildren. Separate entrances ensure that each section has its own identity. Within the library, a meeting room features retractable walls and chairs and tables that can be replaced with soft seating and rolling collections when the space is not being used for programs, a semi-enclosed teen space, a children’s area with a window seat that doubles as a performance stage, and a central hearth with a gas fireplace. Service Flexibility: The renovation of the library at the Columbus High School Campus includes flexible areas suitable for performances or meetings, while meeting modern technological needs. The library serves six schools housed at the campus. Service Flexibility: A 500-square-foot outdoor Poets’ Patio connects to the library through floor-to-ceiling glass walls that can be opened to expand the building’s capacity to host large events. The community room and meeting/study rooms are fitted with movable partitions to enhance adaptability. Service Flexibility: The expanded Pickaway County District Library contains an after-hours section that can stay open longer hours with minimal staffing. The after-hours area includes high-demand services such as meeting rooms, a computer training lab, café/gallery, teen center, and reading areas with popular materials. Service Flexibility: The Windmill Library was built for future expansion, with more than 7,000 square feet that has been finished on the outside and wired and plumbed on the inside but that is currently unused. When the community grows, the dividing wall can be removed and that space converted to house library materials. The building features automated sorting equipment and RFID technology to improve material turnaround, and a custom self-service kiosk where patrons can pay fines and fees electronically, while a rooftop solar array will produce up to 8 percent of the building’s energy demand. Service Flexibility: The City Centre Library was constructed with raised access floors to allow for the reconfiguration and adaptation of electrical and mechanical systems to serve potential future layout changes. Because the community is expected to outgrow the originally proposed 65,000-square-foot building in five years, the design included 17,000 square feet of unfinished space that can be leased to generate revenue until the library is ready to expand into it. 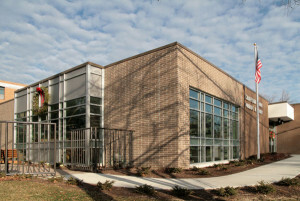 Service Flexibility: The South County Library doubles as a community cultural center, with more than 12,000 square feet dedicated to meeting rooms, a 200-seat auditorium, café, bookstore, and special young adult room, all of which are accessible outside of normal library hours. The library offers drive-up services, community reading gardens for children and adults, and access to pedestrian and bicycle paths. Service Flexibility: Dedicated group-study rooms and open casual-study space are located adjacent to the library in Allard Hall. The building has opened itself for the entire university population, not just the law school: A wood-clad atrium is equipped with retractable seats and can be used as a lecture hall, for fundraising events, or as a moot court. Classrooms are designed with horseshoe seating to encourage debate and collaborative learning. Service Flexibility: The library in the Hans W. Klohn Commons was designed with the recognition that the collection will be significantly different in 2020 than it is today. The print reference collection was reduced to about a third of what it was in the facility the new library replaced, and most of the print collection now occupies electronic compact shelving. Occupying the space freed up by those moves are centers for tutoring in writing and math/science, two classrooms, nine group study rooms, and a café. 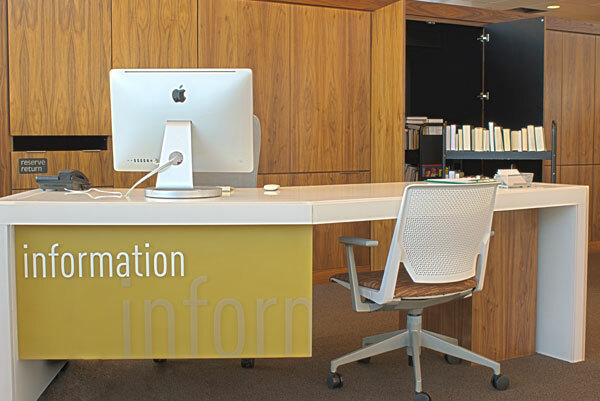 Service desks are relatively small and inviting, made of a semi-translucent white composite with custom cabinetry behind to hold necessary supplies.